Today I visited Tehku Tea Company and had an opportunity to sit down and have a chat with the owner, Inggrie Merriman (over a pot of tea of course) to learn a little more about tea and what inspired her to open TehKu. Inggrie, originally from Indonesia opened TehKu, which means “my tea,” with her husband a few years ago in the Historic District of Dublin, OH. When I asked her what inspired her to open a tea company she told me that in the culture she grew up in it is very natural and almost expected that a family would open their own business.� So, when it came time for Inggrie to open hers, tea was a natural choice. She told me a story of growing up in a culture that was very family oriented and one of the things she missed the most about Indonesia when she moved to the US over sixteen years ago was enjoying “Dim-Sum” (which means “with tea”) with her Mother’s family (which could sometimes end up being over 50 people) at least once a week.� She wanted to introduce this tea culture to this fast-paced society, by encouraging people to sit and take time to reconnect with family and friends. 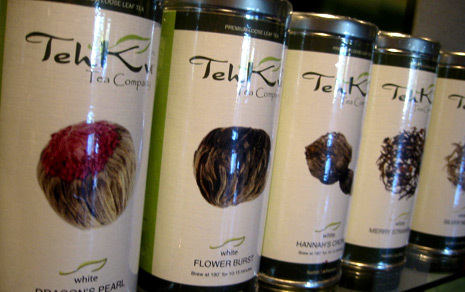 Where� do TehKU teas come from? Inggrie makes a few of her own custom blends, but for the most part TehKu teas come from various farms throughout the world including Japan, India, Indonesia, and some teas come to TehKu blended by companies in Germany.� A good number of the teas are organic although they are not specifically labeled as such on the tea menu because many farms Inggrie works with adhere to the same strict farming practices without going through the certification process. What are some popular teas that most anyone would like? With over 50 different types of teas and a healthy rotation of new ones coming in regularly, it’s hard to choose.� Lately the Walnut Crunch (green), Almond Cookie (black), Earl De La Creme (black) and Creme Oolong are popular choices.� And I really wish you could smell the Cherry Blossoms green tea! Tea newbies, check out this handy chart to get you started. And for the more experienced tea drinker to try? Matcha, a green tea from Japan, is definitely one to try; the leaves are hand picked and stone ground into a fine powder.� You can also find Match iced, in delicious scones and in the Bubble Teas at Tehku.� Another great selection is a smokey black tea by the name of Lapsoung Souchang. Inggrie has always loved Oolong tea, she says it’s great for everyone because it doesn’t “betray you.”� Meaning you can’t really mess it up, she said it’s the perfect selection if you are in a hurry and don’t have time to wait for the water to reach a full boil or the tea to steap.� Inggrie said that throughout her life she has always enjoyed searching for and indulging in new and more rare types of Oolong. One of the most impressive things about Tehku, other than the huge selection of loose leaf tea, is the philosophy and the nature of the design behind the company.� Inggrie and her husband named their Tea Company “TehKu”� because they want you to enjoy their wonderful teas the way you like it and they set up a bar-like education center to help you do just that (just check out the TehKu list of events to find the next tea tasting).� She told me that from the very start she knew she wanted it to be something that any age group could enjoy and has always been mindful of their impact on the environment. Next time you are in the Columbus area, you must come up to Dublin to experience TehKu in person, someone is always waiting to help you pick just the right tea for you. Just because tea is grown in other parts of the world doesn’t mean there isn’t a way to keep it as local as possible. You aren’t going to find local tea leaves here in Indiana, but certain companies like Kei Tea take those worldly leaves and blend them with locally grown herbs to create fresh “local” teas. I first met the owners of Kei Tea at the Carmel Farmers Market. I emailed them a few more questions regarding their local tea and they provided me with these interesting tidbits. Thanks Kei Tea! Are there any herbs in particular that grow well in this area? It’s possible to grow nearly any type of herb in Indiana if you make use of indoor space in the winter. However, our favorite herbs to grow outdoors are lemon grass, lemon balm, chamomile, any type of mint, lavender and of course, catnip. People are often surprised we use catnip in some of our teas but it actually was the original plant used in Egypt for tea and has a mild sedative quality for humans (unlike its effect on cats). Do you use any other local ingredients other than herbs — such as flowers, seeds, etc.? 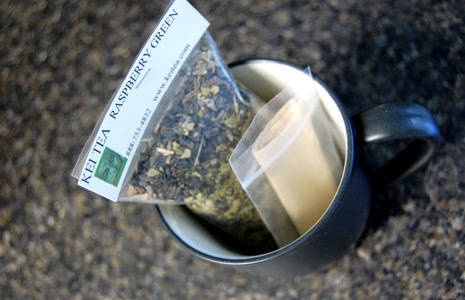 Many of our teas use seeds such as fennel, fenugreek, and milk thistle. The seeds from these plants have great health benefits. Fenugreek is reported to help with blood sugar regulation, and milk thistle is good for cleansing your liver. Any special growing techniques that you use? We try to grow everything organically and think plants grow better when we harvest seeds from our best specimens – that way we know we have a plant that likes to grow in a particular area. Many herbs regrow annually and so we just tuck them in with a little straw in the fall and uncover them when the time is right in the spring. The following is an excerpt from an interview with Victoria Wesseler of GOING LOCAL. Click here to read the full article. Tell us some more about GOING LOCAL and what inspired you to start it? After taking early retirement from a business ethics and regulatory compliance consulting business that I founded and ran for twelve years, I wanted to do something totally different with the next phase of my life. Something that combined my love for gardening, food preservation, and cooking and helping people be successful in those pursuits. My friends kept telling me that they loved my homemade food, recipes, and gardening tips and that I should find a way to share that information on a larger scale. One night on a flight coming back from a business trip in Seattle, I got the idea for a blog site which could be used to do just that. I chose to focus my content on Indiana local food-something I am very passionate about-while still providing the cooking and gardening information. The name "GOING LOCAL" and the logo just came to me. The image of that logo was so clear in my mind and the concept felt so right that I knew I had to pursue it! The site was launched in September 2007. Sources for delicious, healthy, locally grown, and in-season foods. Information about Indiana farmers, businesses, and individuals who grow, raise, produce, and sell local foods. Recipes and tips for preparing seasonal dishes that are healthy, quick, easy, and delicious. To share thoughts, ideas, and experiences for "Going Local" in Indiana. My goal is for GOING LOCAL to be the "go to" site for Indiana local food lovers. Interestingly enough, I do get quite a few out of state visitors since much of the information about cooking, preserving, and gardening can be useful to anyone. And many of the Indiana producers ship their products around the country so those not living in Indiana can still enjoy many of the great food items that I feature on the site. You mentioned that the idea of preserving foods was first introduced to you by your husband, who grew up on a Southern Indiana farm. Does the same hold true for eating locally, or was that something you began doing at an earlier age? Growing up, I never wanted to learn how to cook. The kitchen was the last place you’d find me standing in on a regular basis! It wasn’t until I divorced in my late 30s and took a few cooking classes that I began to cook for myself and appreciate the value of using fresh, in-season ingredients. As my interest in cooking grew, I began to seek out quality ingredients and that lead me to discover local farmers markets and local food producers. But my heartfelt passion for local food really grew when I married Robert in 1994 and we began working in our own vegetable gardens. We now have 7 acres where we grow and preserve about 50% of all the food that we eat. Your culinary skills are exceptional to say the least. Do you think that being a good cook makes eating locally easier? That is really a huge compliment, given my late start in the kitchen! But I think it’s just the opposite. Eating locally makes you a better cook. When you have ingredients that are fresh and flavorful, you really need to do very little to them to make an outstanding dish. The recipes on the GOING LOCAL site are very simple because my assumption is that when you make them, you are going to use fresh, in-season fruits, vegetables and herbs; and/or locally produced meats, eggs, honey, and dairy products. With ingredients like that, the less you do to them, the better the final dish will taste. What’s your favorite recipe at the moment (or of all time)? My favorite recipe of the moment is whatever I’m making with something that’s fresh, local, and in-season. My favorite recipe of all time is my late mother’s frittata because it has great sentimental value to me and reflects my philosophy that good ingredients prepared simply will always produce the best meals (and sometimes, as in the case of this special recipe, the best memories). We previously featured a fantastic website, Smart Foods Healthy Kids, right here.�The following is a interview with the CEO/Chief of Belief Kelly Corbet. 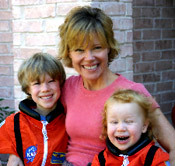 What inspired you to start SmartFoodsHealthyKids.com? The site obviously focuses on kids, how do you get your own kids excited about eating healthy and taking care of the planet? In our house, healthy is just what we eat. And since every kid loves a cookie or cake, I try to make healthier versions for my own kids. I never want them to feel like they are �missing out� because of their healthy diet. I�ve noted in my own life how force creates resistance. Probably the biggest factor in my kids� healthy diet is the input they have. I try to empower them by having them help me prepare meals, and take them shopping with me. I give them choices, and if they want cookie dough for breakfast, that�s fine�healthy in fact, given the way I make it!� (See Kelly’s Cookie Dough recipe below). Of course, the rest of the world doesn�t eat like us�yet! And I don�t want our kids thinking other people are �wrong.� We are all on different paths, and I let our children know that for our own family, we eat the perfect things for us. I noticed you have written a book, �Love Lessons From My Mom,� any plans to write a second? Oh yes! I�ve just got to put the final touches on my cookbook. I call it a �cookbook,� but it�s a mixture of food, philosophy and public policy�sort of like our website!